Buying a new mattress or bedroom furniture set should be easy and enjoyable. Unfortunately, it is not always that way. To ensure satisfaction we have experts to assist you in making the right decisions that will fit your needs and lifestyle. We want you to be satisfied with your mattress choice, so we offer a 30-day comfort trial on all of our premium mattresses. See store for details. With most mattress sets, Siesta Sleepworks will provide you with delivery, set up and removal of your old mattresses donated to HGRM charity in our trading area. 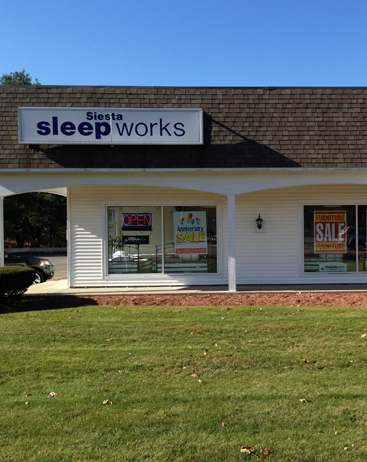 At Siesta Sleepworks, our specialty is SLEEP. We carry every type of sleep surface; latex, visco memory foam, and all types of innerspring mattresses.We have the knowledge and expertise to find the right solution for you. Browse Siesta's largest selection of platform beds, solid hardwood bedroom furniture, bunk beds and futons.The beds and furniture come in all sizes and many finishes. 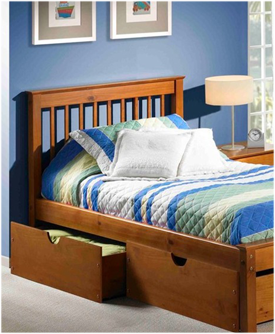 Storage drawers and trundles are available with most beds. Our furniture is beautifully made and build to last. Siesta Sleepworks futon and cover selection is vast: Solid hardwood frames in a myriad of finishes with the hottest fabric designs available for your futon cover needs. Remember -- When you buy a mattress, buy it for comfort, buy it from someone you trust, and buy it from someone who will provide service well after your purchase.